Today: Shauna shows us that a classic like banana bread can be equally as delicious sans grains. Once you are released from gluten, you find out something you didn't know when you automatically reached for that bag of all-purpose bleached wheat flour: flours have flavors. Quinoa flour is a little grassy, and very savory. Buckwheat is nutty, and teff flour has a faint chocolate-y, molasses taste. If you choose flours based on their flavors, you might stop thinking about gluten altogether. You'll choose the flours you have for how they can make a banana bread sing, for they how they'll make your children say yum after they take their first bite. We go through a lot of quick breads at our house. Our 5-year-old runs hard and dances through her day -- she rarely sits down -- and so she has the metabolism of a hummingbird, quick to tire if she doesn't eat. To combat that, I like giving her homemade squash bread, pumpkin bread, and zucchini bread. Her favorite by far is banana bread. Recently, I started baking with more almond flour for her sake. High in protein, almond flour has fewer carbohydrates than bleached white flour (or rice flour), is lower on the glycemic index, and has more fiber as well. She doesn't know any of this. She just thinks this banana bread is good. And that's because I thought about the flavors with these flours: bananas and almonds are complementary flavors, as are maple syrup, cinnamon, buckwheat, and coconut. Throw them all in together and bake them in a loaf pan? You have a warm, nutty banana bread that is ever-so-slightly sweet. 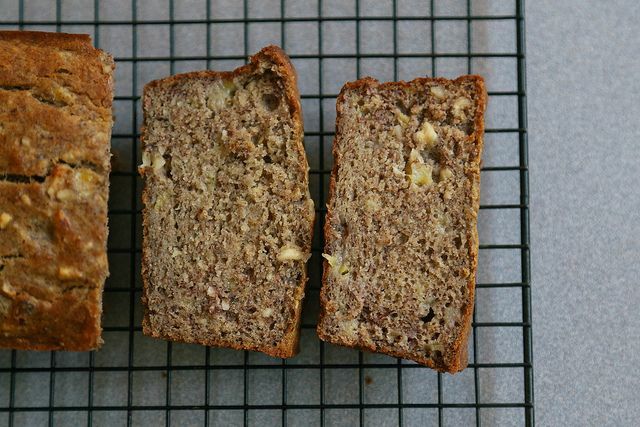 Without the refined sugars, this banana bread tastes more of bananas than sweetness. You taste the nuts and their fats. You taste bananas and almonds and maple syrup. The fact that it's gluten-free, grain-free, dairy-free, and refined sugar-free? Well, that's nice for the people who need those things. But for you? 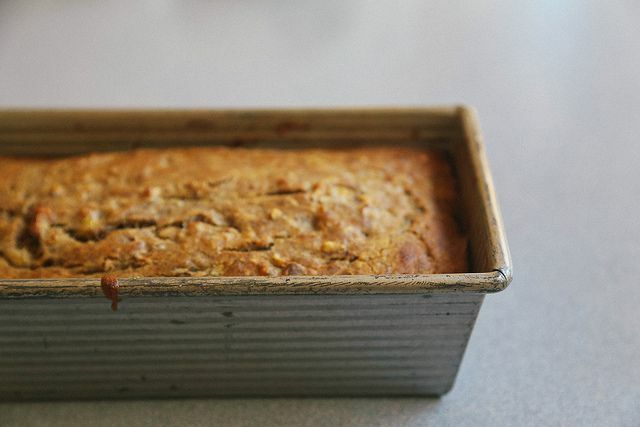 This is a darned fine banana bread. See the full recipe (and save and print) here. strange my original comment seems to have gotten erased- I used 3/4 cup olive oil, and it worked like charm. Thank you Shauna! Where may I find the Imperial/American (non metric) measurements for recipes? Is buckwheat flour not a grain flour? Buckwheat is not a grain; it's not wheat. It's related to such vegetables as sorrel and rhubarb. Looks delicious! Will be making this! Thank you. I like dates, as well as date sugar. But remember when you are subbing dry sweeteners for liquid sweeteners, you have some fiddling to do! date sugar is an option...but for the arrowroot try tapioca...I've found this to be a better one for one substitution. But if you have the scale out to measure the flours, you're not wasting time at all! In fact, it saves you time. I had asked about this previously, and my comment posted but then disappeared. Anyway, I see the recipe here has been corrected, but the version contained in the link to the full recipe still has cinnamon listed in the instructions but not the ingredient list. Unfortunately, this kind of sloppy writing/editing is all too common with this columnist. Anyway to get the recipe in cups? I know I should use a scale, but I have yet to convert and I'm interested in trying this recipe. I would start at about 1/2 cup for each of the flours and the starch, totaling 1-1/2 cups total. At 210 grams, this seems about right since most measurements for AP flours weigh in at 140 grams. I agree with Kaye -- what makes maple syrup a better option than refined sugar? I love this! Can I switch some ingredients? Like another starch for arrowroot and agave for maple syrup? how important is the arrowroot in this - its the only thing I don't have in my cupboard! I would sub tapioca starch, potato starch, sweet rice flour, or cornstarch for the arrowroot. Hope that helps! This is why I love baking by weight. As long as you sub in the same amount of grams, you can use whatever starch or flour you want! Can't wait to try it!!! Thanks! Could one add zucchini to this? I am looking for a great gf/gf zucchini recipe. Thoughts? Medjool dates are another great sub for sugar, and they play well with quick breads. Love that you're baking without refined sugars. Thanks for the recipe!